The Williams Fork near Leal gage measures a key component of Denver Water's water supply. A reconstruction for this gage was first developed by Connie Woodhouse in 2002, and then re-calibrated in 2004 using new tree-ring chronologies that end in 2002. The 2004 re-calibration is shown below. This reconstruction was used in analyses described in Woodhouse and Lukas (2006). Woodhouse, C.A. and J.J. Lukas. 2006. Multi-century tree-ring reconstructions of Colorado streamflow for water resource planning. Climatic Change 78: 293-315. A forward stepwise regression procedure was used to calibrate the observed flow record with a pool of potential predictors consisting of ~30 tree-ring chronologies from Colorado). The residual chronologies, with the low-order autocorrelation removed, were used. Four predictor chronologies were selected by the stepwise procedure for the reconstruction model for the Williams Fork near Leal. Validation statistics were computed using a leave-one-out (cross-validation) approach. Further details are provided in Woodhouse and Lukas (2006). Figure 1. 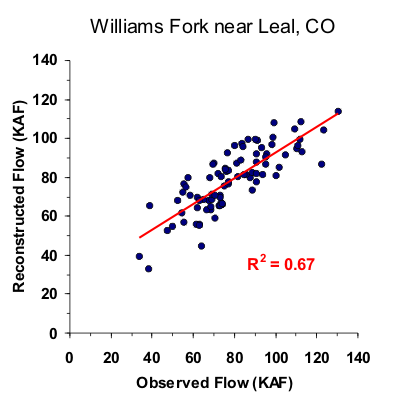 Scatter plot of observed and reconstructed Williams Fork annual flow, 1916-2002. Figure 2. Observed (black) and reconstructed (blue) annual Williams Fork annual flow, 1916-2002. The observed mean is illustrated by the dashed line. Figure 3. Reconstructed annual flow for the Williams Fork (1383-2002) is shown in blue. Observed flow is shown in gray and the long-term reconstructed mean is shown by the dashed line. Figure 4. The 10-year running mean (plotted on final year) of reconstructed Williams Fork flow, 1383-2002. Reconstructed values are shown in blue and observed values are shown in gray. The long-term reconstructed mean is shown by the dashed line.